We are watching our diets in this house. The doctor put my husband on a diet, so I'm doing most of the cooking now. I try hard to keep variety in the meal so it doesn't seem like a "diet". In fact I heard the other day, "It's not a diet, it's a life style change." D.I.E.T. is a four letter word after-all. Our neighbor gave us several really ripe tomatoes. My husband doesn't like raw tomatoes... so what was I going to do with these tomatoes before they go bad??? The recipe posted does not show nutritional information. I recently heard of MyFitnessPal and I used their site to get the information for Calories, Carbs, Fat and Protein. I entered the information as the recipe is written as well as other options. Cut a thin slice off the top of each tomato. Leaving a 1/2-in.-thick shell, scoop out and reserve pulp. Invert tomatoes onto paper towels to drain. Meanwhile, in a skillet, brown beef; drain. Add tomato pulp, chili powder, sugar, salt, pepper and oregano; bring to a boil. Reduce heat; simmer 45 to 50 minutes or until slightly thickened, stirring occasionally. Add rice; mix well. Simmer 5 to 6 minutes longer or until rice is tender. Stuff tomatoes and place in a greased 13-in. x 9-in. x 2-in. baking dish. Combine bread crumbs and butter; sprinkle over tomatoes. Add water to baking dish. Bake, uncovered, at 375 degrees F for 20 to 25 minutes or until crumbs are lightly browned. I ended up using the brown rice, green salsa (probably 1 cup), Italian Seasoning, garlic powder,cayenne pepper and the middles of the tomatoes. I boiled the rice. While it was cooking I browned the turkey and added the spices to it. 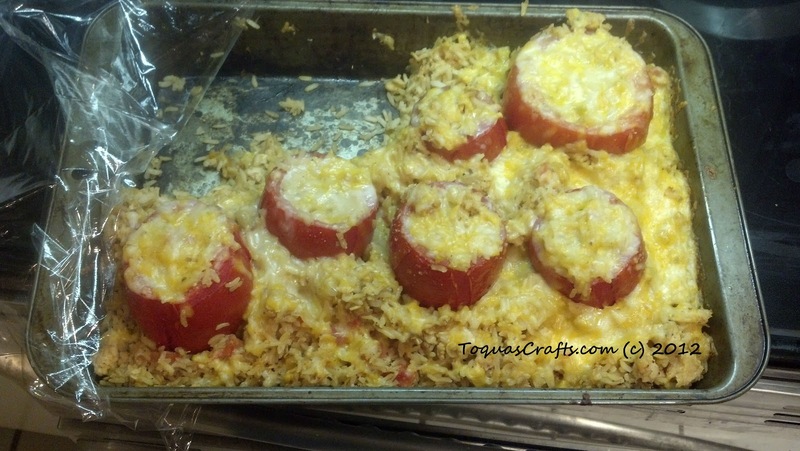 Once I cooked added the tomato centers and the rice and mixed it all together. 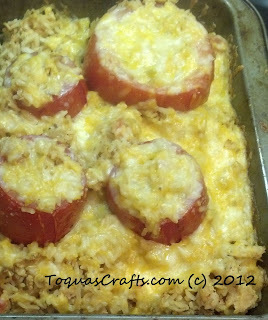 I then got a 9 x 13 pan out and put probably a tablespoon of cheese in the bottoms of the tomatoes. I followed that with the stuffing. I had plenty of stuffing left so I put it around the tomatoes and used it to prop the tomatoes up. I then sprinkled the top of everything with more cheese (probably 1 cup). I baked for about 20 minutes. If you look close in the picture you can see where the skin split on some of the tomatoes... they were PERFECT! My husband even liked them! If you try the recipe I'd like to hear what variations you use!